Call for the 3rd International Euro-Mediterranean Conference – Whither Europe? Europe has become the epicenter of the unresolved post-2008 world capitalist crisis in every aspect — social, economic, political, geopolitical. “Secular stagnation”, recession and deflation pressures affect the European Union more than every other group of countries with millions of people without a job, or a shelter, or health services or education. All claims that the EU and the Eurozone have left the crisis behind have been proven false. This is clearly shown by the impasse in the confrontation between the EU, the European Central Bank and the IMF, on the one hand, and the new Greek government elected in January 2015 with the clear mandate to put an end to the nightmare of “austerity”, the measures of social cannibalism imposed by the troika, on the other. The so-called “institutions” of global and European finance capital want to impose the indefinite continuation of these measures, using all the means of cynical blackmail and finance gangsterism, despite the social catastrophe that their policies have produced and against the will of the resisting impoverished popular masses. The prospect of a Greek default or of a “Grexit” from the Euro-zone, despite the self-reassuring claims that the consequences could be “contained”, will definitely have a devastating impact on the globalized capitalist economy. Even the voice of the City of London, the Financial Times, a protagonist, together with the German capitalist press and the Wall Street Journal, in a hatred and slander campaign against the anti-austerity demands not of the government but of the Greek people itself, had to admit: “Grexit could lead to a global financial meltdown, similar to the one triggered by the 2008 collapse of Lehman Brothers…” (5 May 2015). The US administration has recognized too that such an event represents not a local, national or European but “a global systemic risk”. Whatthe ruling classes fear mostis not solelyfinancial-economiccontagion but contagion of an unyielding and victorious workers’ and popular resistancethroughout Europe, bothin theover-indebted , depressed periphery as well as at the center, a resistance expanding internationally, North and South, West and East. It is not the much publicized “Quantitative Easing” program launched by the ECB in March 2015 that can stop either the crisis or its social and political effects — the class struggle andsocial anti-systemic movements. “Liquidity” generated by Mario Draghi’s program will help for a short period bankers and speculators producing more financial “bubbles” which will then burst in new crashes; it will make some people from the 1 per cent “from above” richer and the 99 per cent “below” poorer; but it cannot reverse the recession trends, thereby bringing a sustained recovery, putting an end to cuts in wages and pensions, austerity, mass unemployment, precariousness and pauperization. Devastated Greece in turmoil is a microcosm of the capitalist world at large, representing the “becoming Greece” of every country. The divide between center and periphery is fading.There are zones of devastation, ghettos, and marginalization developing everywhere. The majority of the people are reduced to a majority of all kinds of oppressed minorities, facing increasing discrimination and police brutality, living in a “state of exception” that has now become the rule.In the last instance, it is this permanent social discontent that is behind the crisis of legitimacy and regime crises, to one or another degree, in the European countries and in the EU itself. “Fortress Europe” is the final outcome of an imperialist, racist, decayed EU, which has transformed the Mediterranean Sea, from Gibraltar, Lampedusa to Rhodes, into a marine cemetery, where thousands of migrants and refugees from Africa, the Middle East and Asia drown, as they are trying to escape from the wars, plunder, and destruction spread precisely by the same European (and US) imperialists. But the apartheid walls of this Fortress Europe are not only “external”, with its borders guarded by the killing machine of Frontex, but internal as well, secured by equally barbaric State apparatuses and rising far right and fascist groups. At home and abroad, we are all migrants, oppressed and exploited by the same class enemy. The EU project and the introduction of the common euro-currency were tied from the beginning to the new world situation, pompously and falsely labeled “the end of History” by bourgeois triumphalism, following the inglorious collapse of “actually existing Socialism” and the demise of the Soviet Union. The expansion on a continental scale of European imperialism, its unification on capitalist bases around the German-French axis, the re-colonization ofEastern Europe, the Balkans, and of the former Soviet republics were considered indispensable in the competition for hegemony in the post-Cold War world. The tragedies of Greece and of Ukraine, both linked to EU policies, demonstrate clearly the failure of the entire project. Greece is the broken link of the international chain of the Euro-zone. The financial and political implosion of Ukraine into chaos, Maidan, the rise ofBandera nostalgics and openly Nazi forces, covered, financed and mobilized by Western “democracies”, the resistance and rebellion in Donbass, the colonization terms imposed by the IMF program on a pauperized Ukrainian population, national hatred and chauvinism of all kinds, the sharpening confrontation between Russia and US, EU, and NATO imperialism are clear signs not of a new Cold War, but of a post-post-Cold War world, the end of the “end of History” proclaimeda quarter of century ago. All the most dramatic questions of history — war, revolts, counter-revolution, revolution — are again on the agenda on the European Continent itself, not in far away Third World countries, interacting with a Middle East in flames and convulsions all over the Balkans, Eastern Europe, Caucasus and the former Soviet Republics. Greece is not solely the most acute manifestation of the European and international crisis in the social economic and political sense. It is situated at the center of a triangle of wars provoked by imperialist intervention and exacerbation of the crisis in the region: Ukraine in the North, Syria/Iraq in the South East, Libya in the South. The dangers are increased with the discovery of oil and gas deposits in Eastern Mediterranean and the sharpening of all local and international antagonisms, first of all between Greece, Turkey and Cyprus. There-rapprochement and building of astrategicalliancebetween Athens, Nicosia, Tel Aviv and now Cairo under the butcher of the Egyptian revolution General al Sisi, and, from the other side, the neo-Ottoman ambitions for regional hegemony by the Erdogan regime in Turkeyaccumulatedynamitein a region where already there is an inferno in Syria, Iraq, Libya and Yemen. It is no coincidence thatAthens, Greece hosted , amidst the tremendous social struggles against the troika policies and their Greek collaborators in power, as wellasin the aftermath of the first wave of the revolutions in the Middle Eastdubbed the “Arab Spring”, two importantInternationalEuro-Mediterranean Conferences.Bothwere organized by the Balkan Socialist Center“Christian Rakovsky”, the RedMed web network, andrevolutionary internationalist parties of the CRFI,and were hosted by the EEK of Greece, butit was open to militant workers and popular organizations and social movementsfrom Europe, and internationally,involved insocial struggles against capitalist barbarism today,as well as the forces of the Leftcoming from different traditions. 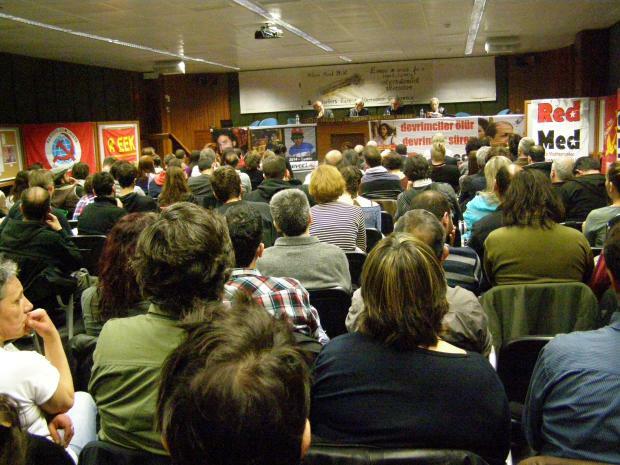 The First Conference, in early June 2013, coincided and was intimately linked with the popular rebellion in Gezi Park, in Istanbul.Against the chauvinistic enmity that the ruling classes on both coasts of the Aegean cultivate, Turkish and Greek revolutionaries, with other fighters of the revolutionary Left and the social movements coming from other countries and different political traditions joined in a manifestation of internationalism in practice to discuss freely and decide about common programmatic points and plan common actions for a socialist way out ofthe crisis. The Second Euro-Mediterranean Conference took place in Athens at the end of March 2014, with the Ukrainian volcano in full eruption. Among the participants were both Russian and Ukrainian Communists and other left militants from the Balkans, Eastern Europe and the Middle East, who, after a common debate, in their majority voted and issued an internationalist, anti-imperialist and anti-chauvinist Declaration. On this political basis further common actions, in the next explosive period, took place in the Balkans, Ukraine, Russia, and elsewhere. Now, a Third Euro-Mediterranean Conference will take place in Athens, on July 18-20, 2015, in conditions coinciding again with the most dramatic and unexpectedchanges in Europe, Western and Eastern, in theBalkans, in the former Soviet republics, particularly in Ukraine and Russia, in the Middle East, Africa, and Latin America, all over the present world in crisis and transition. A draft will be presented in timely fashion to all participants as material for discussion. Documents from other invited militants, parties, organizations, trade unions, social movements are welcome for distribution and discussion. A Final Statement will be discussed, amended, and voted, to be issued subsequently. A special session will be dedicated to a debate between militants in the international workers and trade union movement, to elaborate a Manifesto of Struggle and Solidarity, as well as a Plan of common action, particularly in Europe and the Middle East. The problems of revolutionary organization on a national and international level need to be discussed urgently, in the light particularly of the recent dramatic experiences. Fight for the cancellation of ALL the debt that robs and crushes the lives of millions, through the expropriation of the banks under workers control. All the “austerity” plans of social cannibalism imposed by the EU, the ECB, the IMF and the capitalist governments have to be stopped immediately. The capitalists have to pay for the crisis of their system of exploitation, not the exploited! We have to fight to restore wages, pensions, and social rights of the working people according to social needs, not for the profits of the few. Against mass unemployment, we call to fight for the prohibition of sackings, for distribution of the working hours among all workers. Public works of infrastructure, which are anyway vital and urgently needed, have to be developed to create new jobs. The barons of big industry always blackmail workers to accept more cuts of wages and jobs, claiming that otherwise they would have to close or “de-locate” their factories abroad; our answer should be: occupy all factories that close or fire workers en masse, expropriate the factories in question, without compensation, making them function again under workers control and workers management. For a resolute struggle against fascism, racism and discrimination against immigrants and refugees, women, sexual orientation, against all oppressed minorities! To put an end to the Police State and the phony “State of Emergency”, by dismantling the bourgeois state apparatus of repression. To put an endto NATO andto dismantle all imperialist military bases and alliances, opposing actively and defeating their war plans towards theEast and South, towards theformer Soviet republics, orto reestablish imperialist “law and order”in thechaos they produced in the Middle East . Full solidarity to all anti-imperialist struggles of oppressed nations in Africa, the Middle East, in occupied Palestine, in divided Kurdistan and in Asia and Latin America! Our battle-cry should be: Down with all capitalist governments! For workers governments and workers power! Down with the European Union of the imperialists, the prison of peoples! No to the reactionary trap of nationalism! For arevolutionary socialist unification of Europe from Lisbon to Vladivostok! This entry was posted in EU, Kannanotot, Polttopisteessä. Bookmark the permalink.